The turn of the century witnessed growing popular awareness that the vast quantities of goods produced in the world’s newly industrializing regions and consumed in large part in Europe and North America come at a price: in the words of one best-selling title, “The China Price”. Asia in general and China in particular stand out in this account as a kind of no-man’s-land for human, environmental and labor rights, and have been the arena for repeated anti-sweatshop campaigns over the past thirty years. Numerous initiatives involving state, inter-governmental, corporate and civil society actors have been elaborated to address these issues, leading to a dizzying multiplicity of norms and standards, along with a plethora of tools and procedures designed to implement them. In particular, the rise of new forms of “soft law” — loosely grouped under the rubric of “corporate social responsibility” (CSR) — have led some authors to conclude that we are entering a new era of global governance in which private, voluntary normative regimes will increasingly displace state-based “hard” law and regulation. Assessing this claim empirically is difficult, requiring both breadth in perspective and depth in analysis. As many have argued, measures classified as “soft law” are not simply a milder or more flexible version of “hard law” but a series of governance techniques with their own objectives and design that are best understood from the persepctive of industrial management, social control or “social harmony” (in the Chinese vocabulary). With this in mind, our research project set out to collect in-depth and detailed data on the particular tools involved in recent CRS initatives in order to understand the variety of functions and meanings that these instruments take on at different places and times. In this presentation, Professor Hertz will focus on one particular innovation in the area of “capacity building” for “corporate social responsibility” (CSR): worker hotlines (工人熱線), frequently established at the behest of brands and intended for use by the workers in their supplier firms. Fieldwork carried out with a number of such hotlines in Beijing, Shenzhen and Guangzhou suggests that they are a polysemic, multifunctional innovation, serving simultaneously as a source of information for workers on their rights, as a security valve for worker dissatisfaction and as an up-close-and-dirty monitoring tool that brands can use to survey the activities of their suppliers through weekly or monthly reports from hotline operators. However, brands do not entirely control the meanings and functions of this innovation. Our interviews show that many of these operators – often trained as social workers – consider labor rights as “narrow”, “economistic” or “legalistic” responses to a much broader problem – the need to take into account the worker’s “whole person”. This discourse fits within the more general contemporary tendency in mainland China to portray migrants from rural provinces as uncivilized, “low quality” and generally in need of improvement if they are to become proper urban citizens. 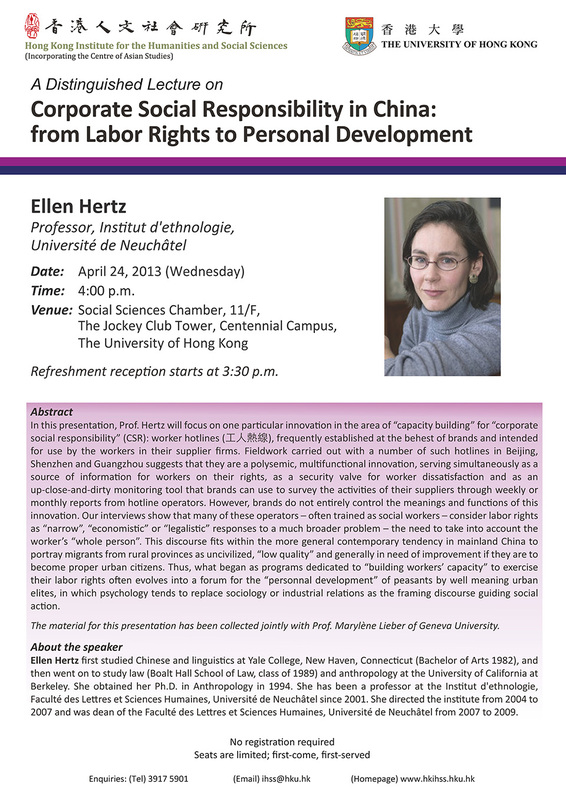 Thus, what began as programs dedicated to “building workers’ capacity” to exercise their labor rights often evolves into a forum for the “personnal development” of peasants by well meaning urban elites, in which psychology tends to replace sociology or industrial relations as the framing discourse guiding social action. 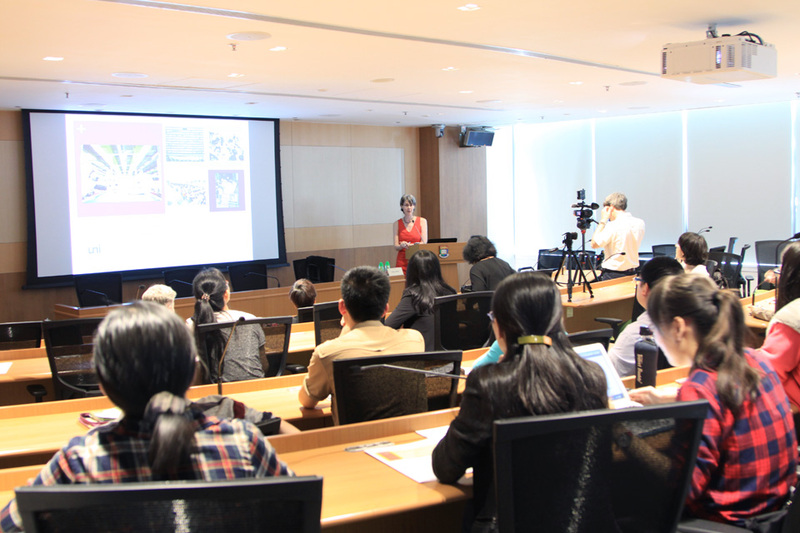 The material for this presentation has been collected jointly with Professor Marylène Lieber of Geneva University. 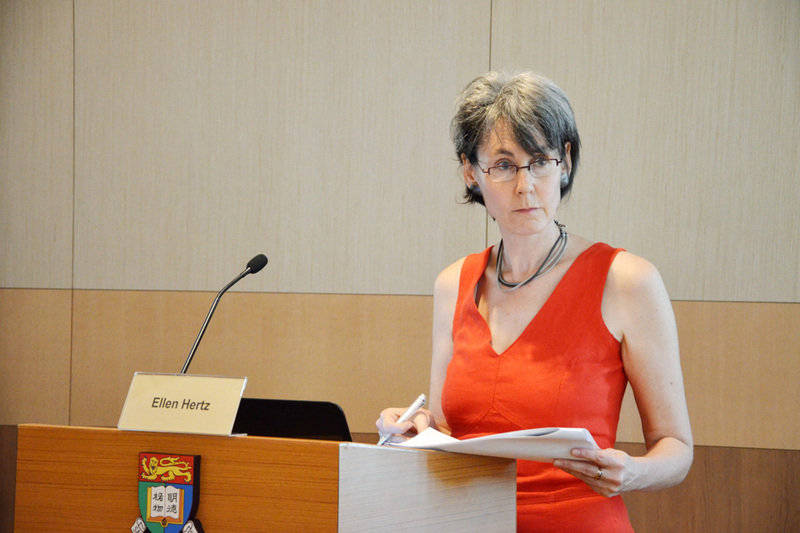 Ellen Hertz first studied Chinese and linguistics at Yale College, New Haven, Connecticut (Bachelor of Arts 1982), and then went on to study law (Boalt Hall School of Law, class of 1989) and anthropology at the University of California at Berkeley. 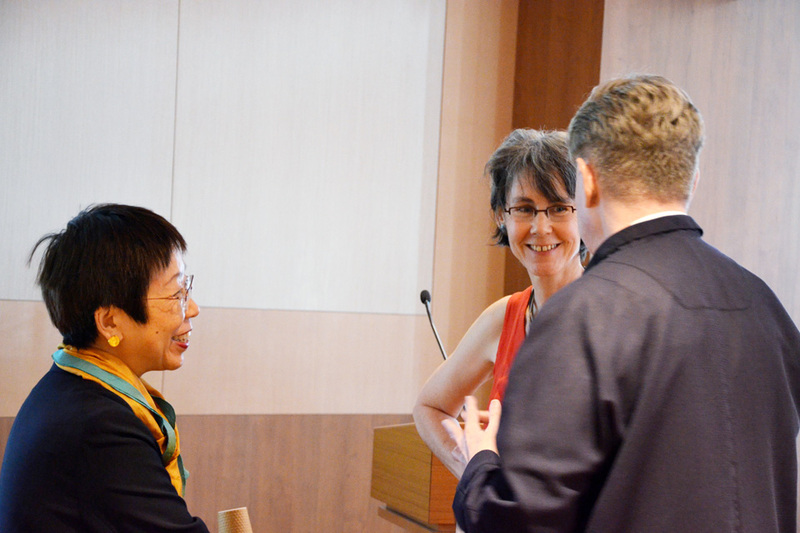 She obtained her Ph.D. in Anthropology in 1994. She has been a professor at the Institut d’ethnologie, Faculté des Lettres et Sciences Humaines, Université de Neuchâtel since 2001. 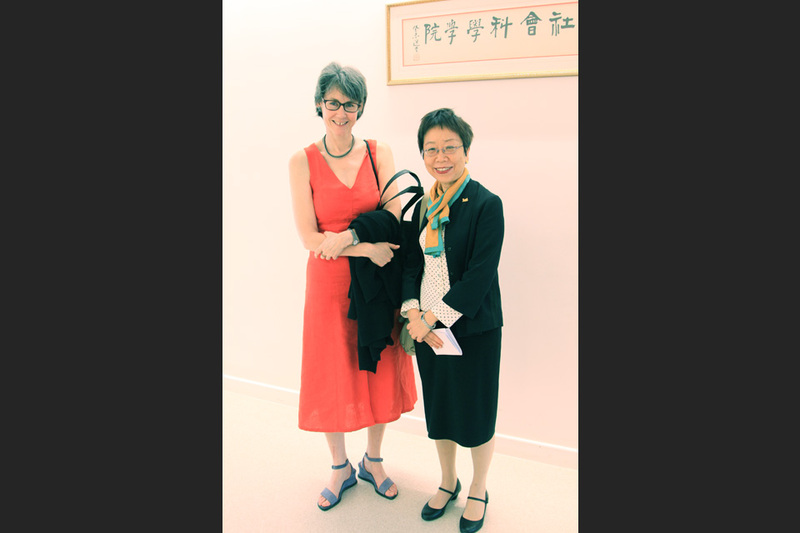 She directed the institute from 2004 to 2007 and was dean of the Faculté des Lettres et Sciences Humaines, Université de Neuchâtel from 2007 to 2009.